The little Willard was as prepared as Zimmerman Marine’s crew could make her. As we cleared the shallow waters of East River at 8:45 a.m. on July 6, we slowly made our way into Mobjack Bay and Chesapeake Bay. I let out the paravane arms; the narrow side decks would make such an exercise a tricky affair once we were offshore. Steve D’Antonio and I—the only crew—planned to deploy the paravane fish as soon as we reached deeper water. From earlier sea trials, we knew the stabilizers needed 11 feet of water while the boat was stopped. Under way they trailed behind a bit, requiring 8 feet or so under the surface. Steve Zimmerman went out ahead of us in a skiff to take some photos of the finally finished boat, now fully rigged. Besides the stabilizers, Zimmerman’s crew added open array radar on a short mast that also supported the outrigger arms with short rigging wire. As Steve drove in circles around Willie, I thought that we were finally on our way, with over 650 nautical miles to go before reaching the approach to Bermuda at Northeast Shoals, on the north side of the islands. We’d talked about doing this trip months ago: taking a capable small boat and preparing it to safely and smartly travel to the most popular but serious offshore destination of East Coast sailors: Bermuda. Some 640 nm east off the coast of Virginia, it is a significant offshore trip, made more so by the ever-present and changing Gulf Stream. Anyone who contemplates a Bermuda passage must navigate through the Gulf Stream, a meandering body of warm water that creates its own sea conditions and weather systems. It promises seafarers only one certainty, and that is a surprise for the unprepared. As the U.S. East Coast dealer for Willard Marine, it seemed logical for Steve Zimmerman to select their smallest displacement trawler, the 10,000-pound Willard 30, for our project. It is a rugged and simple boat, powered by a single 50hp Yanmar diesel. The Willard 30 is a small boat even for a couple, but a good basic platform on which ZMI could develop those safety and passagemaking features deemed necessary for a boat headed offshore. And if the 30-footer could do it, Willard’s 40-foot model was a no-brainer. We passed Chesapeake Bay Bridge at 1:10 p.m., 27.4 nm into the trip. The rolling swells were on our beam for the last 15 miles of the bay, and we deployed the flopperstoppers a bit late, after a series of rollers got the port arm banging skyward. The paravane system helped settle the boat’s motion immediately, limiting the extreme ends of each roll. While they slowed down the motion, they did not stop it nearly as much as an active fin system. But an active system is near impossible to fit aboard a boat this small, not to mention the expense and complexity. The autopilot drive whined softly throughout the day and into our first night. Alone for my first night watch, I found myself singing inside my head, as if prompted by some subliminal music. I soon realized it was the autopilot—the drive’s operation set my imagination in motion. The whirring motor sounded a lot like Tracy Chapman, as if a radio played her music at very low volume. Tracy the autopilot sang all the way to Bermuda. At 7 a.m. on our second day we were in the Gulf Stream. After an uneventful night watching images of ships crisscrossing the radar display, we held our course through the traffic patterns. Nothing came within two miles of Willie as she steamed ahead at 6 knots. The purplish blue of the Gulf Stream water reminded me of other’s comments that being offshore must be a lonely and monotonous experience. I find it just the opposite, especially in the Gulf Stream, home for large sea turtles, dolphins, whales and flying fish. We saw many. Steve, who teaches celestial navigation to the sailing midshipmen of the U.S. Naval Academy, has made this trip 10 times, so had all the charts and nav tools. We mirrored navigation in electronic and traditional forms, complete with plotting paper and sextant. The borrowed Furuno Navtex receiver was a bonus, as I found it a wonderful tool to keep us updated with text messages explaining the weather images we received on the weatherfax. The two electronic marvels are quite helpful for offshore travel, providing the latest information available. The only thing better is a professional weather forecasting service. By the time we reached the middle of the Stream, water temperature was 85 degrees Fahrenheit, and we had all doors and ports open to maximize ventilation. Later in the day, as we worked our way out the other side of the Gulf Stream, the seas flattened out completely. Had we been aboard a sailboat, becalmed we’d be. But on this motorboat, it was a delightful way to settle into our offshore routine. Willie chugged merrily along in the warm purple sea. Due to the small galley and camping mindset of the two-person crew, meals consisted mostly of cereal and sandwiches, although the diesel stove made coffee and tea at times, and Steve occasionally made toast. Given the motion and living space aboard the small boat, neither of us had much interest in cooking or eating anything involving more than two ingredients. Our lives became a rotating series of naps intermingled with reading, talking about boats, food, Italy, boats and potential shopping opportunities for our wives in Hamilton, capital city of Bermuda. Around us, the ocean remained alive, and the sea clear, with no floating garbage or plastic. By about the second day, it was clear the paravane gear on this boat was too small. Willard’s designer, Rod Swift, had designed the components of this system for Zimmerman, but the vanes were too small and lightweight. Swift selected Kolstrand’s small vanes (19 pounds and 120 sq. inches, for boats up to 30 feet LOA), but the beefy 30-footer would have been much better off with Kolstrand’s medium-size vane (30 pounds and 192 sq. inches, for boats 30–50 feet LOA). It would be something to look at once we returned home. Simplicity itself, the single 160-gallon fuel tank on the Willard 30 does not require the fuel management routine of larger, complex boats—transferring fuel from auxiliary tanks to a day tank, and changing trim as fuel is consumed. A joy of small-boat ownership, it was simplicity through minimalism. Steve used a calibrated metal rod to dip the tank after our first 24 hours at sea. According to the markings on the metal dipstick, we had used about 20 gallons our first day. A FloScan fuel monitor also had been installed, and we checked its accuracy with the dipstick. The technician who put it in had done his calibration well—it matched the physical check exactly. FloScan equipment uses flow sensors on the feed and return fuel lines to keep track of net fuel burn. Since many boats have odd-shaped tanks with guesstimate-quality sight gauges, I don’t understand why all trawlers don’t have FloScan equipment on board. It is comforting to monitor fuel consumption in real time, using it also as a benchmark for changes in the operating environment, such as catching line or grass on a paravane or underbody, which might increase engine loading and fuel burn. Steve’s sextant plots (checked against the GPS plotter) put us ahead of schedule, and it seemed we would arrive at Northeast Breakers in less than three days. But to get there we first had to punch out of the Gulf Stream and its contrary currents. Dinner that night was simple, but hot…Progresso Chicken Soup. It’s hard to describe just how tasty such fare is when you’ve had no hot food for a day or two. The Wallas diesel stove worked great and without a diesel smell. Although it was not gimbaled, the stove potholders held the single saucepan securely. Our second night passed by with little fanfare: seas were calm and winds light, and no shipping to avoid. We both slept soundly on our off watches, hot bunking on the converted saloon settee. Steve dipped the tank and reported that we had used 40 gallons in 48 hours, traveling some 288 nm. Not bad for a pint-sized passagemaker! The deep oil pan on this particular engine allowed us to check the oil at idle using the engine’s dipstick, eliminating the need to shut the diesel down for this important check. But there was one surprise—a fair amount of water had collected in the Racor 500 filter, which had been installed to augment the on-engine fuel filter. We were able to drain it out without shutting down the engine, but the watery slush that came out contained what looked like fiberglass fibers. Like translucent tapioca sludge, the fibrous mixture was odd—after all, it came out of an aluminum tank. What could have caused this? Had the Willard workers left the tank’s inspection ports open during construction so that remnants from sanding/grinding/cutting fiberglass around the boat were allowed to somehow settle in quantity into the tank? It was very strange, but I was thankful that Steve’s crew had added a large, separate fuel filter in an accessible location. Back up at 2600 rpm now, we ran at 6.1 knots, with vanes out of the water. We’d gone 288 nm in two days and it was calm enough now that the vanes’ slight drag was more of a bother than the slight increase in boat motion. A lovely situation. The forward cabin and V-berth were pretty useless during this trip, even running in such calm conditions; the motion was uncomfortable and the space too cramped. So all our personal “stuff” stayed up there for the duration, and we lived at the helm and in the saloon with galley opposite. It was like living in a 16-foot interior. Having a third person aboard would have been too much in the small space. Belying its small overall size, storage on the Willard 30 is surprisingly good. On the day before our departure from Virginia, Steve and Max (skipper of the return leg) purchased and stowed food provisions for two people for 24 days. It all fit in the galley’s lockers, although some lockers required cut plywood dividers to separate large open voids into practical storage spaces. The single Yanmar purred at 2600 rpm. I hoped we would not need any of the contents of the spares kit put together for us by Steve McGovern of Mack Boring, the New Jersey-based East Coast distributor for Yanmar. We’d discussed the project with McGovern at length, and despite his extreme confidence in the Yanmar product, he gladly put together an “ultimate” spares kit in a waterproof box that he lent us for the voyage. We decided to carry the spares because there simply was no room for a get-home backup system. Early in the planning stages, I’d gone out on a limb by telling Zimmerman that we would be fine with one engine as long as we had proper spares aboard, and if he made sure the boat had proper fuel filtration. Once past 50 engine hours, modern diesel failure on this sort of voyage is so extremely rare—beyond fuel and cooling circuit issues—that I am convinced get-home employment is mostly a mental exercise. One engine component that did need attention was panel illumination. With the boat’s slanted instrument console, the top lights on the Yanmar panel illuminated out beyond the top of the gauges, ruining night vision. I cut a paper plate into dial faces that we taped over the gauges to cut the glare down; it did the trick. Installing the console panel more vertical also would help, as would a dimmer switch. Steve laughed when I made this analogy, but agreed the voice fit the crime. Finally coming out of the clutches of Gulf Stream countercurrents and eddies, we continued to run with the vanes out of the water. At this point, we maintained a steady 7.2 knots, on flat, oily seas midway between the U.S. East Coast and Bermuda—each 328 nm away from our position. I hoped a helicopter would fly by and record the event, a little boat on a big ocean. We celebrated the lazy day by reading; Steve had a stack of magazines he had not had time to go through, while I savored every page of Tom Brokaw’s The Greatest Generation. My hat goes off to Furuno for making the manual unnecessary. As we approached 56 hours under way, we’d gone 340 nm, averaging 6.0 knots. As another night came upon us, Steve and I discussed what we called the “Boat Lengthening Phenomenon.” At night, alone at the helm, both Steve and I perceived a change in the boat. During nocturnal operation, the Willard 30 grew in length. Seriously, the boat felt bigger, seemed to go faster and rolled like a larger boat. I’m sure it has to do with a change in sensory input, but I could swear we added several feet in length when the sun went down. At dawn on July 9, we had but 233 miles to our waypoint off Bermuda. With less than two days to go, the sun brought hope for calm, and a reduction in humidity that had swelled all of the books and papers on the boat. The vanes were back in the water now after a line of thunderstorms chased us around the ocean and churned up the seas. We used the radar to effectively dodge individual thunderstorm cells, avoiding the possibility of a lightning strike, but the brief storms also brought a rise in humidity, forcing us to button up tight in driving rain. I put Rain-X on all forward helm windows before we left Virginia, and it did wonders to keep the windows clear throughout the voyage. The sliding helm door had not been treated, and the visibility out that port was difficult at best. Rain-X is a wonder product for a cruising boat and I highly recommend it. Following our now daily ritual of checking fuel and engine at 8:45 a.m., Steve once again dipped the tank, more for something to do rather than necessity, with the FloScan keeping us accurately informed. We continued to use just 20 gallons per day, consuming 60 gallons to make 440 miles. We also found more water and sludge in the Racor, so we carefully drained the contaminants without shutting down. The stuffing box was warm, but so was the seawater, still over 80 degrees. That afternoon, the weatherfax revealed a change in the weather, with a front developing over the Southeast United States. The new forecast called for a gale to form behind us, with gale-force winds developing seas of major proportions. It was a threat that we watched carefully, but as Willie had only about 160 miles to go, we hoped to stay ahead of the system. We were out of Navtex range for updates from the United States, but it soon would pick up broadcast signals from Bermuda. We hoped. I was feeling a bit bummed by the thought of running with a gale at sea, a situation that seems to happen with regularity. But as I finished making note of the fact, dolphins came out of nowhere and danced around the boat with tremendous enthusiasm. They loved the paravanes trailing along the sides of our small boat, and they took turns swimming under the boat from side to side. It was as if they were reassuring me not to worry too much about the weather. In any case, it’s all part of the deal when one goes offshore. Of course it did get worse, and the next dawn, our last of the voyage, saw Willie in closely spaced, steep beam seas that rolled us unmercifully. The rising sun showed clear skies ahead of us, and we were now 90 miles out, but Willie, Steve and I were covered in salt, a crusty trio. Thankfully, we picked up the Northeast Breakers Racon late that afternoon, right on the money. Steve’s navigation was spot on, with a little help from the GPS. It took another couple of hours to navigate past Northeast Breakers, Kitchen Shoals and through Town Cut into the safety of St. George’s Harbour. Standing straighter with the knowledge we’d made it and were within sight of land, we completed the required radio call to Bermuda Harbour Radio on VHF. The professional and friendly communication link to mariners is a top-notch operation that oversees all vessels coming and going. We were instructed to proceed to Ordnance Island for customs, which would remain open until midnight if we could make it in time. Approaching midnight, as we made the turn to starboard to line up Town Cut and its range lights, we suddenly heard loud thuds all around the boat. For some strange reason we were under attack by large flying fish. They slammed into the hull at speed, bouncing off with a bang or flopping onto a side deck near the open helm door. I tossed several slimy creatures back into the dark water. It was a funny incident that relieved some of the stress that had built up as we pushed to make Bermuda at night ahead of a storm. Motoring into the calm of St. George’s Harbour, we could not even see Ordnance Island, as two huge cruise ships dwarfed the little island. From my perspective the scene was surreally like the scene from Apocalypse Now. Imagine it: two crusty seamen—in tune with darkness, the sea and its silence—motoring quietly out of the shadows on a small boat. We were reentering civilization, but amid hundreds of vacationing people milling about the pier grounds and town square, with several hundred more partying loudly with bright lights and music on the upper boat decks of party-mode cruise ships. As we slowly approached the bright lights and noise of nightlife merriment, we were like Martin Sheen rising from the muddy waters of the river, yet not one person noticed the little trawler from Virginia tying up at the customs dock, dwarfed by ships whose lifeboats were larger than the 30-foot Willard. We stepped off Willie and completed the check-in process in short order. Now midnight, our chances for a victory dinner were slim. We settled for a cold beer at a nearby bar, a raunchy place that smelled of cigarettes and sweat, and we were soon back aboard Willie for a sandwich and a beer among shipmates. Amazingly, as grungy as we must have looked, no one noticed. We slept like the dead until early morning. I tried out Willard’s V-berth—the narrow berth and its lack of handholds didn’t matter to one so tired. A couple of local fellows came walking by the boat before I was in any mood to get up, and I listened to their idle chatter as they gawked about the “real little ship.” They had to know crew slept only a few feet from where they stood talking on the pier, which was rudely unnecessary, but it forced us to get up. The accommodating customs official had let us stay at his dock for the night, with the understanding we would be gone by 7 a.m. Seems the pilot boat needed the space, although it came in early and had no trouble at the dock. But the day was started, and we moved Willie to an arranged slip at the St. George’s Dinghy and Sailing Club, where we could clean and be cleaned, and get the boat ready for the return crew. Max Parker and Mike Egan were scheduled to arrive that day. Our early arrival had us meeting them at the airport rather than them meeting us at the dock, and we hoped to surprise them. On a side note, I found the dress of the tourists, locals and cruise-goers disappointing, with cutoff shorts and sleeveless T-shirts the look of the day. What happened to the traditional dress standard of Bermudian evenings? I expected to see ladies in dresses and smart-looking men in sport coats. Those days are clearly gone. Shame. Nothing broke on the trip, so there was only minor maintenance beyond cleaning up after the crossing. Our fuel consumption was a nice surprise. When Max and Mike later bought fuel to top off the tank, it only took 87 gallons, not bad for a 672-mile one-way trip. We averaged 6 knots overall on our way to Bermuda. Mr. Dowling, owner of the only fuel dock at St. George’s Harbour, was impressed with Willie, and what she had done. He could not recall, in over 43 years delivering fuel in Bermuda, of such a small motorboat making the trip from the United States. Most powerboats are over 40 feet, and come to Bermuda to fish. We have no way of knowing if our trip really is one for the record books. That certainly was not our goal, but it is icing on the cake if it’s true. We had set out to see if a small boat could be professionally and adequately prepared for such an offshore adventure. 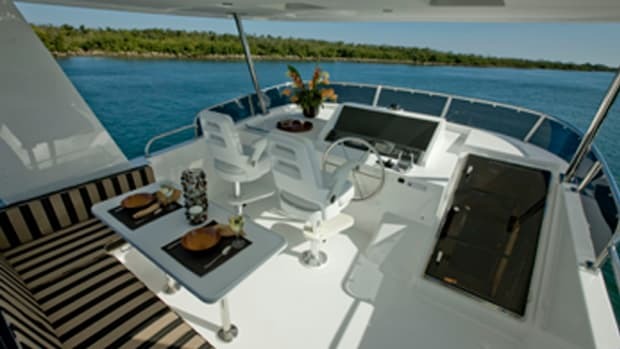 In this we succeeded, and Zimmerman Marine gets five stars for the project’s success. Would I recommend such a trip for most people? Probably not. Would I do it again? Probably not, but only because I am getting older and appreciate more creature comforts—like my own cabin versus hot bunking, a daily shower and a place to sit and enjoy the offshore experience. Thirty feet does not really allow such pleasures. But it sure was fun. On July 13, Max and Mike left St. George’s Harbour on the return trip to Virginia. Steve and I had spent the day before motorbiking around the islands, giving them time to bond with the boat and to get squared away without distraction. They had little to do beyond changing the oil and checking systems, and as we’d not eaten much food, they didn’t need additional provisioning. Needless to say, tempting Neptune isn’t something he’s likely to repeat any time soon. On their third day at sea, they encountered eight hours of rough, windy weather, complete with 15-foot seas off the port beam and winds gusting to 20 knots. One particularly large wave hit Willie squarely on the port beam, with enough force and green water over the boat to trip the hydrostatic release holding the liferaft on the cabin top. The raft was blown off the cabin top, bending its aluminum cradle, and was soon trailing, inflated, behind Willie. The men slowed to idle and pulled it aboard, stowing the raft partially deflated in the cockpit. But overall, Max said the return was mostly in winds less than 15 knots with seas running 3–4 feet. His high point of the trip was sighting three whales 100 miles off Virginia. His other memory is the hazy summer weather, so intense that they entered Chesapeake Bay without sighting land, forcing them to shout, “Bridge Ho!” as they passed the Chesapeake Bay Bridge. They saw no land until they entered East River almost 30 miles up the bay. Max said it was a great trip. Later investigation revealed the fuel contamination on the boat was a mixture of intense microbe growth and what seemed to be fiberglass fibers. Alex Marcus of Environmental Solution tested fuel samples from the tank and found it teeming with biological contaminants and a slurry mix that will be burned to reveal chemical composition. Fiberglass remains the number one suspect. The success of this passage is almost entirely due to the preparation and experience that went into the boat. 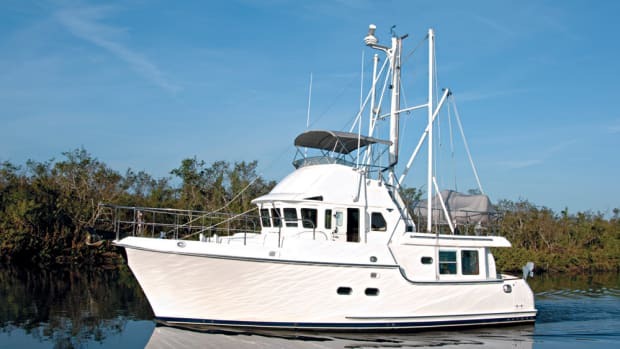 Zimmerman Marine did a superb job of outfitting this trawler, and the proof may now be in the record books. 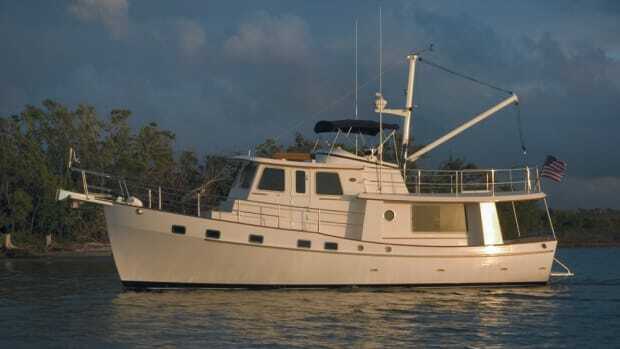 These folks transformed a stock Willard 30 from simple cruiser to offshore veteran. Willie covered 1,349 nm in all, using 205 gallons of fuel. Range issues aside, I think we also have shown that a displacement trawler, a semi-displacement motoryacht, or even a downeast-style cruiser can be made offshore ready, even if one’s agenda is closer to home. I think it also is safe to add that a solid dose of seamanship helps. Thanks guys, let’s do it again some time.